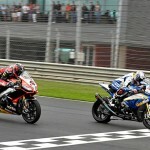 Eugene Laverty and Marco Melandri split a pair of victories at Monza but the most biggest news from the World Superbike weekend was a strange series of appeals after Race Two that saw Tom Sykes finish third, relegated to fourth and then reinstated on the final step of the podium. The unusual mix-up occurred after Sykes, sitting in third place, ran off track and into the run off area on Turn 5 on his final lap. The Kawasaki rider returned to the track again in third place where he finished ahead of Aprilia‘s Sylvain Guintoli. After the race, Aprilia filed an appeal and race stewards initially assessed Sykes with a penalty, dropping him one-position and awarding third to Guintioli. This morning however, Kawasaki appealed to the FIM Stewards’ Panel which analyzed the race footage and sector times for Sykes, Guintoli and second-place finisher Melandri and decided to reinstate Sykes in third. But that may still not be the end of it as Aprilia has five days to lodge another appeal, this time to the International Disciplinary Court which would then make a final decision. 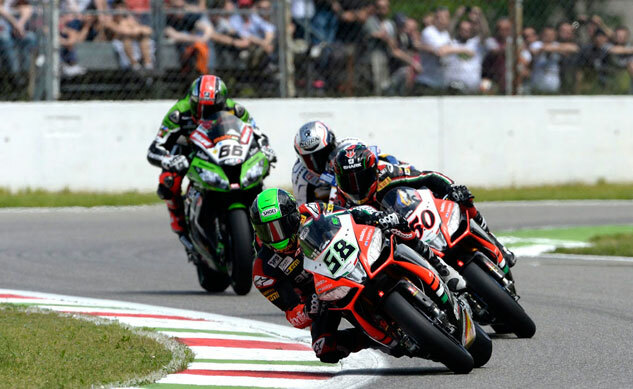 The first race started with fivesome of Aprilia’s Laverty followed by Pata Honda‘s Jonathan Rea, Kawasaki’s Sykes, BMW Goldbet’s Melandri and Guintoli. The lead group of five became four on the next lap as Rea missed a gear exiting the first chicane, dropping him from contention. 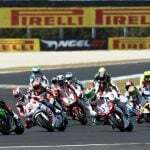 Laverty held on to the lead until he was passed by teammate Guintoli on Lap 8. 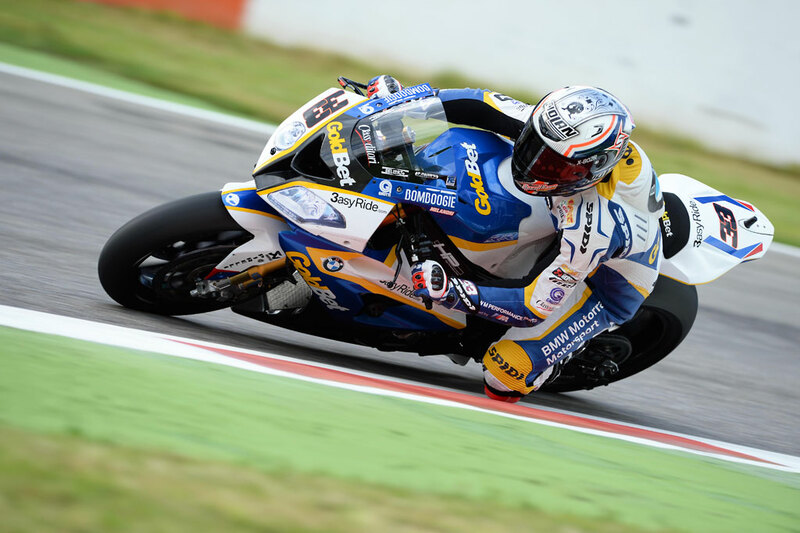 Guintoli then faced pressure from Melandri who narrowed the gap and took over the lead on Lap 11. The lead changed once again on Lap 15, with Sykes taking his turn up front. His lead was also short-lived with Laverty returning to the lead on Lap 17. That set up a dramatic final Lap 18 that saw Melandri crossing the finish ahead of a hard-charging Sykes with Laverty finishing within 0.107 seconds behind. The second race began with Laverty once again taking the early lead. Joining the leaders this time was Althea Aprilia rider Davide Giugliano, though he had a bit of a wobble on Lap Two that forced him wide through a chicane and dropped him several places. That left another lead pack featuring Laverty, Sykes, Melandri and Guintoli once again all within a second of each other. Laverty held the lead up until Lap 8, dropping into second behind Guintoli. 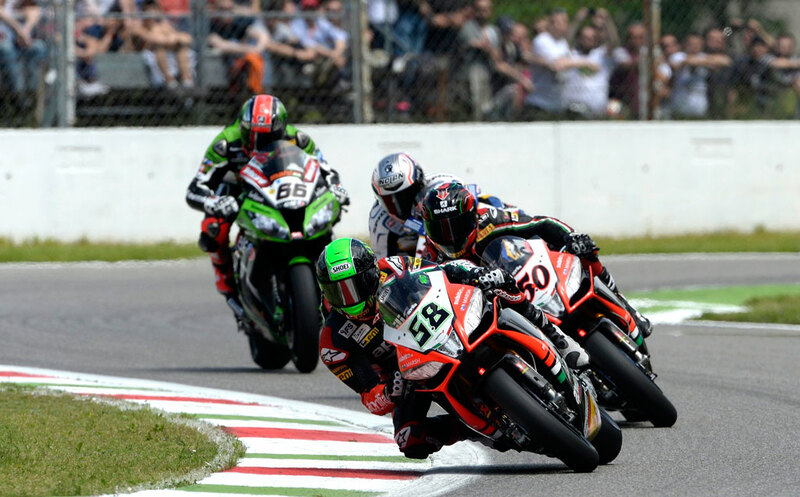 The Aprilia duo swapped position again a few more times for several laps before Laverty emerged with the lead on Lap 17 with Melandri taking over in second place. That set up the last-lap drama with Laverty in first place followed by Melandri and third place still to be decided in the appeal process. The Disciplinary Court’s final decision will have a strong bearing on the championship. As it stands, Guintoli holds the championship lead with 137 points ahead of teammate Laverty who has 124. Sykes sits third with 119 points. If the Disciplinary Court decides to again reverse the results of Race Two, that would give Guintoli 140 points and Sykes would drop to 116. 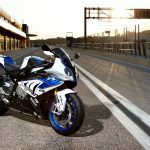 2 Marco Melandri BMW S1000RR +0.14.